With 91 opioid overdose deaths every day in the United States, it's no surprise that social workers helping clients with opioid use disorders sometimes feel ineffective. We became social workers because of a mission to facilitate recovery and well-being for vulnerable populations. This unconscionably high death rate takes its toll on our country's communities, as well as the social workers who serve them. There is a solution. There is a way to save our communities. Interventions are available that save lives and support recovery. Medication-assisted treatment (MAT) is an evidence-based response that works. MAT utilizes behavioral and other health approaches, such as motivational interviewing, cognitive behavioral therapy, relapse prevention therapy, trauma recovery support, and other community-based supports. While the medications—methadone, buprenorphine, and naltrexone—vary in how they work, all help return the brain to its normal state by blocking the euphoric effect of opioids, minimizing cravings, and reducing withdrawal symptoms to support recovery. Unfortunately, tools such as MAT are underutilized, largely because of stigma and misunderstanding. However, social workers have the skills, ability, and training to change this dynamic. For many in the addiction field, our education in understanding addiction did not come from academic training; it came from colleagues and supervisors. Many leaders in the addiction field are also in recovery, and their lived experience is an asset. They dedicated themselves to making sure their clients knew there was a recovery path to healing and wellness. They also dedicated themselves to teaching others how to help people with substance use disorders find their recovery path. While this generation of leaders and counselors was well intentioned, they did not have the benefit of the science and knowledge available today about addiction. The traditional addiction workforce used the skill and tools that were available to them. With that came some misunderstanding of what addiction is and how it impacts the brain. Diagnoses such as codependency were used to help explain substance use disorders. Stigmatizing language, such as "addict" and "character defects," became part of the addiction treatment terminology and jargon, and it shaped how we think about, treat, and care for people with substance use disorders. For many years, the only answer to addiction was thought to be complete surrender, and "real recovery" could only be achieved with abstinence maintained with 12-step meetings. While these components may be critical aspects of recovery for many, they may not apply to others. Now, social workers are integrating the neurobiology of addiction into practice, which can be personally or professionally challenging. Learning new approaches can collide with established practices that provide inadequate tools. However, with the current opioid epidemic, we can no longer wait. Moral judgment is part of an antiquated, inferior, and ineffective system. Social workers can manifest change by helping create a new and more effective system to treat substance use disorders. As the catalysts of change, social workers must reexamine the status quo and overcome the discomfort of going against traditional methods of addiction counseling. 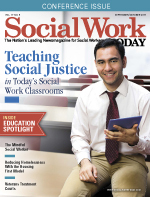 Equipped with this understanding, social workers can use new tools, including MAT. Simply put, MAT works. Used as a support, it can help clients stay in treatment and maintain longer periods of abstinence. Social workers' skillset aligns with the support clients need when utilizing MAT. The same support social workers provide to help clients navigate the choices to use medications to treat mental illnesses such as depression can be used for addiction. MAT is a tool for recovery and should be an option for anyone who has a substance use disorder. There is no shortage of research supporting MAT and its long-term positive health outcomes. The National Institute on Drug Abuse (NIDA) praises it, saying, "Clinical trials have shown Vivitrol (injectable naltrexone) to be effective in preventing not only relapse to drug use following detoxification but also to diminish cravings that often drive it." Research published in Drug and Alcohol Dependence states the use of buprenorphine/naloxone (Suboxone) in monthly physician-appointment treatments has long-term positive patient health outcomes. NIDA reported that those in MAT programs experienced dramatic improvements while in treatment, with additional societal benefits extending for several years following treatment, including decreases in narcotic use, drug dealing, and other criminal behavior as well as increases in employment and marriage. Nora Volkow, MD, director of NIDA, says, "I don't think that there are any areas where the data are shaky. It clearly shows better outcomes with medication-assisted therapy than without it. Studies have shown that outcomes are much better when you are on medication-assisted therapy. For one, it decreases risk of relapse—significantly. Second, MAT has also been shown to be effective in preventing infectious diseases like HIV. Third, medication-assisted therapy has been shown to be effective in preventing overdoses." All people with a substance use disorder deserve the opportunity to use MAT as part of their recovery path. A preliminary report issued by President Trump's White House Commission on Combating Drug Addiction and the Opioid Crisis recommended increased access to MAT as a key component of its work to curb the nation's opioid epidemic. The Commission recommended establishing and funding a federal incentive to enhance access to MAT and require that "all modes of MAT are offered at every licensed MAT facility and that those decisions are based on what is best for the patient." Despite widespread evidence of its success, the barriers to adopting MAT are challenging. In a letter to the editor of The New England Journal of Medicine, clinicians at the University of Vermont, Friends Research Institute, and Yale University School of Medicine were forthright, noting that, "despite the demonstrated efficacy of maintaining abstinence by treating patients with opioid agonists, patients can remain on clinic waiting lists for months, during which time they are at risk of premature death." Although federal laws have theoretically made MAT easier to access for the past few years, the opioid crisis has outpaced the health care system's ability to train enough providers in the most current science and equipping them with the evidence-based tools to meet the demand. By reeducating themselves about addiction and how MAT works to support long-term recovery, social workers can join forces with other providers who either already offer or are interested in offering MAT. By integrating care, we can create opportunities to help save lives and increase clients' quality of life. By challenging how we think and treat substance use disorders, we can directly impact our systems of care. Social workers have a critical role in supporting a shift in the addiction treatment culture to employ MAT. Part of that role is to address the stigma and discrimination people with substance use disorders experience. Social workers can help lead the field away from the misconception that the aberrant, impulsive, and compulsive behaviors associated with addiction are the moral or motivational failings of our clients. It is time we debunk this myth and treat addiction as a biobehavioral disease that involves cycles of relapse and remission, just as with other chronic health conditions. Social workers are trained in a client-centered, strength-based approach and to "meet clients where they are." This is another key strength social workers bring to the addiction field. One of the profession's most valued and effective techniques, motivational interviewing, requires a different way of listening to clients that creates a foundation of rapport and trust. And it's in direct opposition to our ad hoc training in addiction treatment, which encourages confronting "the denial of the addict." This approach is not only judgmental and parental—it might also be harmful. Rather than "confronting denial or the disease," motivational interviewing establishes the most effective clinical tool we have: our relationship with the client. By partnering with the client, social workers let go of identifying character defects and instead highlight our client's strengths and resources. In addition to changes in how we address the behavioral components of substance use, we must be cognizant that because of emerging science, the DSM-5 criteria for addiction have changed. Gone are the words substance "abuse" and "dependence." We recognize that addiction changes the brain. Neuroadaptive brain changes impact impulse control, inhibitory control, and self-regulation—the stuff that leads to relapse and can overpower any person, no matter how self-determined they are or how strong their desire to stay sober. We understand that addiction is a complex disease that impairs brain function and is a chronic health condition. To effectively treat addiction, all three stages must be addressed: binge and intoxication, withdrawal and negative effect, and preoccupation and craving. Social workers have the core competencies to treat addiction as a brain disease and as a chronic health condition. They are experts at understanding systems, catalyzing change at all levels, and navigating the cultural, organizational, and personal dynamics that influence change. By becoming advocates of MAT, social workers are emerging as the thought and action leaders in treating addiction as a brain disease. As we traverse the path of change, we can honor what worked from the past by joining it with what is proven to work now. Our communities need us; our clients need us. It is a life-and-death situation that social workers have the power to change. — Nick Szubiak, MSW, is director of clinical excellence in addictions at the National Council for Behavioral Health.